TORONTO – Kawhi Leonard is a Toronto Raptor, and barring an unforeseen mid-season trade sending him elsewhere that will be the case until at least next July. Then, based on various rumblings, the assumption is he’ll bolt for his hometown of Los Angeles and fulfill his Lakers destiny in free agency. Done deal… unless it’s not. 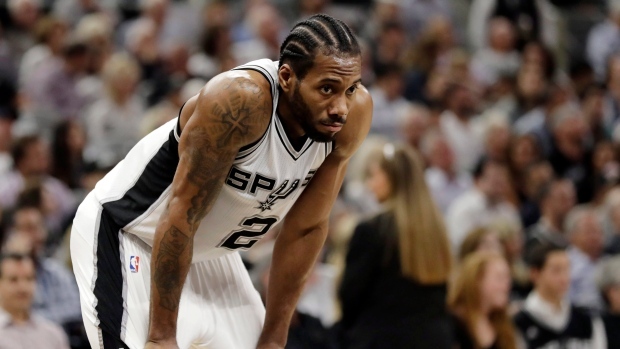 In a Wednesday morning blockbuster, Toronto acquired Leonard from the Spurs (along with Danny Green for DeMar DeRozan, Jakob Poeltl and a top-20 protected 2019 first-round pick), and most have already branded it a one-year rental. That it may be, but you can bet Raptors president Masai Ujiri has a different ending in mind. According to multiple reports that began to surface shortly after the trade was leaked, Leonard isn’t exactly thrilled about the idea of moving north and playing in Toronto. That news wasn’t a surprise to Ujiri, who was made aware of Leonard’s reservations with joining the Raptors before pulling the trigger on the deal, league sources tell TSN. Yet, he did it anyway. Now the clock starts on a (nearly) 12-month long courtship that will determine the futures of both Leonard and the Raptors franchise, together or apart. If nothing else, it will be fascinating. TSN Raptors reporter Josh Lewenberg joins TSN 1150's Tatti and Louie B to discuss the blockbuster deal that shook the NBA that saw the Raptors trade DeMar DeRozan to the San Antonio Warriors in exchange for Kawhi Leonard. That process began almost immediately after the trade became official Wednesday afternoon. The Raptors have been in contact with Leonard and his representatives, according to sources, and those initial conversations have been described as “positive”. ESPN has reported that Leonard is warming up to Toronto, not that he has much of a choice but to embrace this new opportunity for as long as it lasts. For it to last longer than anticipated, Ujiri has his work cut out for him, but he’s going into it with confidence, which shouldn’t come as a surprise to anyone that is at all familiar with Ujiri. Since re-joining the Raptors’ front office in 2013, this time at the helm, Ujiri has been on a mission to change the league-wide perception of an organization and a city that were once punch lines in NBA circles. Of course, he hasn’t acted alone. With contributions from former MLSE president and CEO Tim Leiweke, recently dismissed head coach Dwane Casey, DeRozan, Kyle Lowry, Drake (can’t forget about Drake), and many others, they’ve come a long way in that regard. The Raptors have won games, the fan base has grown and turned heads around the league, all-star free agents have stayed, and with all of that comes respect, respect they have earned. Still, some of those age-old stigmas remain. It’s too cold, there’s too much snow, going through customs is a pain – the classics are hard to shake. Mostly, it’s just different than what most American athletes are used to, even if it’s only a little different. Toronto also happens to be a world-class city, and one few in the sports world feel as strongly about as Ujiri. So he’ll sell it – the diversity, the vibrant nightlife, the food, the (mostly) safe streets, all of it – but, as he always boasts, it should sell itself. And it has before. Former Raptor Patrick Patterson often recalls being on the plane after he was traded to Toronto in 2013. He looked out the window, saw all the snow in the dead of winter, and immediately upon landing he called his agent to say, “Get me outta here”. He would end up falling in love with the city. Kyle Lowry was so sure his stay would be brief he admits to barely speaking with teammates in his first year with the Raptors. He’s re-signed with them twice since. Things change, opinions change, and Toronto is often more than what American athletes expect it to be after actually experiencing it. Like any other city it’s not for everybody, and no one seems quite sure what might appeal to the ever-inscrutable Leonard, but these are just two of many NBA players that have come to enjoy a city they once knew very little about. Maybe it will surprise Leonard, too. If Raptors fans need a cause for optimism, look to the Oklahoma City Thunder, who set a very interesting precedent last summer by taking a similar risk on Paul George, another player who once seemed destined to end up in L.A. While this is a different situation with a different player, there is an overarching lesson to be taken out of OKC’s successful gambit, and it would be naïve to think it wasn’t in the back of Ujiri’s mind when he took his shot. George’s unexpected decision to re-sign with the Thunder is proof that 12 months can be more than enough time to recruit a player, especially when he’s in your gym every day, and especially if you are confident in your team’s culture and with what your organization has to offer. The Raptors’ culture has been shaken ever so slightly following the firing of Casey and trade of DeRozan – both individuals who were crucial to what Ujiri has built in Toronto. He’s betting that the foundation they’ve all established there is strong enough to withstand the change, that it’s bigger than one coach or one player. Whether that turns out to be the case remains to be seen, but it could go a long way in selling Leonard. No, he won’t have a fellow MVP candidate like Russell Westbrook whispering in his ear as George did, but don’t underestimate Ujiri’s power of persuasion and the tools at his disposal. He’s become one of the most well-respected and influential execs in the business, a commanding presence that prides himself on his ability to read and connect with people. Doing so with Leonard will be a challenge, to be sure. He’s an enigma, as much or more than any other player in the NBA. Nobody is really sure what makes him tick. The top priorities for most players are money, wins and team culture – not necessarily in that order – and the Raptors should be able to offer all three. They can offer Leonard almost $50 million more than any other team next summer, including a fifth year. If they’re as good as they think they can be next season, and push for a trip to the Finals in what should be a wide-open Eastern Conference, that could speak loudly as well. However, Leonard already left $31 million on the table by eschewing the super max contract San Antonio could have given him, and just forced his way out of one of the premier franchises in professional sports. What he’s looking for is anybody’s guess. Ujiri and the Raptors will get a head start in trying to figure it out. They’ll have a year to get to know him and convince him that Toronto is the best place for his future. Leonard will do just fine in free agency, provided he’s able and willing to prove he’s fully healthy and regain his pre-injury form with the Raptors this season. Assuming he retains his status as a top-5 player, he’ll have plenty of suitors next summer, including the Lakers and Clippers, if he is in fact hell-bent on going home to L.A. The stakes for the Raptors are much higher. Even though they mitigated some risk by getting this deal done at a surprisingly reasonable price, hanging onto their most valuable assets in the process, their future is very much in Leonard’s hands. The result of his decision in just under a year from now will determine whether the Raptors remain a perennial contender in the East for the foreseeable future, or whether they’re forced to pivot in a new direction, perhaps entering into an earlier-than-expected rebuild.